Results from Fleet 5's "Chesapeake Chapter" - Blew Bird won three of three Twilight Races and placed third in class (11 boats) at the 21-mile Annapolis-to-St. Michaels Race. Chikanery won the first three Twilight Races (June 23 was cancelled). Mysterious Ways took two seconds & a third; Flying Gull a second & a third; and Thunderation a third. 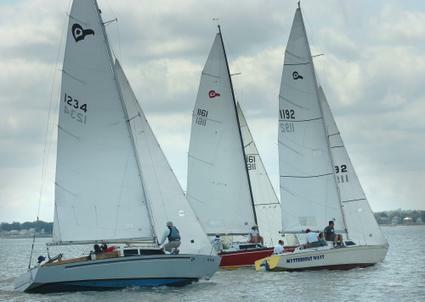 There were seven boats competing in the June 30 race - the most in several years. Mysterious Ways won the Constitution Cup PHRF race. Chikanery swept the Thunderbird Kickoff Series with three bullets. Flying Gull earned second and Mysterious Ways third. Chikanery won the Scorpion Bowl PHRF Race with Flying Gull second. Chikanery won the July 7 Twilight with Flying Gull second & Tank third. The July 14 race was cancelled. Atomic Salsa won the July 21 Twilight with Mysterious Ways second and Thunderation third. Flying Gull got the gun for the July 28 race with Chikanery second and Atomic Salsa third. It was during this race that John Juliano made his Fleet 5 racing debut. John and his girlfriend Jennifer had cruised their T-Bird Taaris from New York to Boston. John drafted Reed Cournoyer for crew and Reed proceeded to show John some of the low spots in Dorchester Bay. Chikanery won a tie-breaker over Flying Gull to capture a memorable Lipton Cup Regatta and the Thunderbird Atlantic District title. In the final race of the series, Tank captured their first bullet. Because of a schedule change, Fleet 5 did not participate in Quincy Bay Race Week. Thunderation posted two wins and three seconds to capture the Spirit Series. Chikanery edged Tank for second place. Tank was unable to complete the final race of the series after being damaged in a collision with Mysterious Ways. Thunderation, Flying Gull and Draco placed one-two-three in the August 4 Twilight race. Mysterious Ways got the gun in the Aug. 11 race but was disqualified. Chikanery got credit for the win with Tank second and Draco third. Chikanery won the Aug. 18 race with Tank second and Thunderation third. Tank won the Aug. 25 race with Mysterious Ways second and Chikanery third. The Sept. 2 race was thrown out. For the series, Chikanery was first with Tank second and Thunderation third. Chikanery also won the Mass Bay Sailing and Fleet 5 Championship awards. Mysterious Ways was second in the Fleet 5 series and third for Mass Bay. Tank took second in Mass Bay and tied for third with Flying Gull for Fleet 5. Tank won three of it's last four events to capture the Mass Bay Sailing Association PHRF Championship in Class D. Tank traveled to Marblehead in early October to win the inaugural Marblehead Chowder Cup to clinch the series title. Tank & Chikanery finished second & third respectively in the Hingham Bay PHRF Governor's Cup Series. T = Twilight Series; MB = Mass Bay Sailing Thunderbird Championship; F5 = Fleet 5 Championship; Dates for MacCormack & Hanson race are tentative.